The Blender Foundation has released Blender 2.79a, the latest version of the open-source 3D software. The update is largely a bugfix release, but does improve performance quite significantly in some areas: tests suggest that the Cycles renderer now runs 10% faster on Windows when using CUDA GPUs. 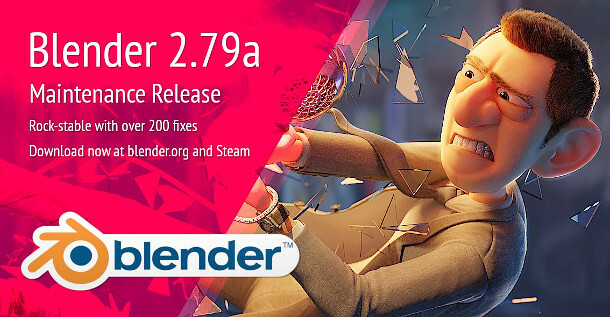 Although 2.79a doesn’t add any new features – the last major feature release was Blender 2.79 itself, which shipped last September – it does include over 200 fixes, “from real bugs to potential security issues”. It also improves performance, “mostly in threaded code”, with the release notes singling out mesh normal and tangent space calculation and the subdivision surface modifier as particular beneficiaries. According to this tweet from Mike Pan, founder of animation studio The Pixelary, the update also cuts render times by around 10% when using Blender’s Cycles engine on Windows. The reduction is specific to rendering on the GPU with Nvidia’s CUDA cards: CPU rendering and GPU rendering using OpenCL are not affected – an issue discussed in this blog post from The Pixelary last year. Blender 2.79a is available for Windows Vista+, Linux with glibc 2.19 and above and macOS 10.6+.